"Highly satisfying....Kirschman...perceptively treats complex racial, feminist, person and political issues while providing intimate knowledge of cops' shop procedure...neatly balances Dot's psychological expertise with her warmhearted humanity...."
HANK PHILLIPPI RYAN: Did you see this cover of TIME? (Remember TIME? A blog for another day.) But so thought provoking, and such an important perspective. Can you imagine? And since some of us write about police officers—it’s so important to understand all sides of the spectrum. Insight is the key to understanding and authenticity. And we are delighted to welcome and her unique and insightful perspective. Thanks for having me back. I was a guest on your blog two years ago. Since then things have changed dramatically. These are hard times to be a cop. 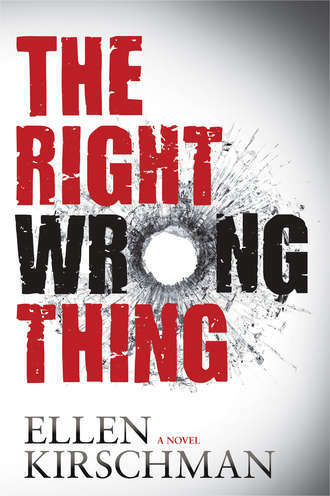 When I began writing the Right Wrong Thing I was simply trying to write a good story about what happens when a cop shoots an innocent person. You may remember that I'm a police psychologist as well as a writer. I switched from non-fiction to writing mysteries in 2013 when I foolishly thought it would be easier to make things up. I use fiction to explore contemporary issues in law enforcement such as police suicide, post-traumatic stress and, in my current work-in-progress, the strain investigating internet crimes against children has on the investigator. My protagonist is psychologist, Dr. Dot Meyerhoff. Dot was my mother's name and Meyerhoff was my maternal grandmother's surname. Neither lived to read my mysteries. It makes me happy to honor them in this way. My books are inspired by clients, all of whom I've deeply disguised to protect their identities. I've lost count of how many officers I've counseled after a shooting. (For that matter, I've also lost track of how many officers' funerals I've attended.) Many are temporarily experiencing physical, cognitive, and behavioral symptoms. For them, time slows down or speeds up. Hands or weapons appear larger than life. Gunshots don't sound the way they do on the firing range. Memory degrades. So does patience. Isolation increases. It's hard to sleep, to stop thinking about the shooting or to engage in normal family activities. These are all involuntary reactions generated by a storm of stress hormones and neuro-chemicals activated by the human response to threats against survival. Normal or not, post-traumatic stress can make an officer feel as though she's going crazy. The client who inspired this book struggled to come to terms with having killed a person even though the shooting was deemed lawful and justified. Like Randy Spelling, the fictional officer who mistakenly shoots and kills an unarmed pregnant teenager in The Right Wrong Thing, my client had nightmares and suffered from extreme guilt and remorse. Unlike Randy, she found a good therapist (apologies for tooting my own horn) to help her recover. I am very grateful to so many officers who have allowed me to fictionalize their stories and helped me get the details right. It is my hope that my books are not only good reads but are informative and shed some light on the too often unacknowledged emotional risks of being a cop or being married to one. HANK: What questions do you have about what police officers think? How they make decisions? How they do their jobs? Ellen is a terrific resource! And she’s here today to give us the scoop. 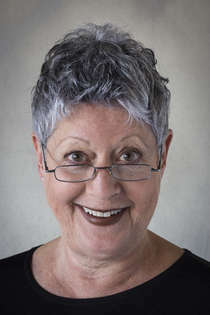 Ellen Kirschman, Ph.D. is a clinical psychologist in independent practice. She is a member of the International Association of Chiefs of Police, the Society for the Study of Police and Criminal Psychology, the American Psychological Association, and the International Association of Women in Law Enforcement. She is the recipient of the California Psychological Association's 2014 award for distinguished contribution to psychology as well as the American Psychological Association's 2010 award for outstanding contribution to the practice of police and public safety psychology. Ellen is the author of the award-winning I Love a Cop: What Police Families Need to Know, I Love a Fire Fighter: What the Family Needs to Know, and lead author of Counseling Cops: What Clinicians Need to Know (2013). Her debut novel, Burying Ben: A Dot Meyerhoff Mystery (2013) is about police suicide told from the perspective of the psychologist. Ellen and her husband live in Redwood City, California. How fortunate police officers are to have you to help them deal with the harsher side of the job. It certainly isn't easy these days; sometimes I'm not too sure it was ever really easy. Being married to a now-retired police sergeant, I've a warm spot in my heart for stories about police officers and I'm looking forward to reading "The Right Wrong Thing." I just completed the local eight week citizen's police academy. I shadowed a female officer for her second shift (3-11pm), during which I watched everything from routine traffic stops to interviews concerning abuse. I learned about programs for communication with local residents. I learned about officers thinking every minute about how a case would stand up in court; there was no room for error. I know why the police patrol the local grocery store parking lot at peak hours...it's not just for purse snatchers! My experience was inspiring and humbling. Thanks for the essay Ellen--it brings up so many difficult issues! One of the characters in my Key West books is based on a real cop--they definitely struggle with public mistrust and anger that have lashed back from current events over the past few years. Joan, I too would love to hear more about your hub's career! Such a timely essay. Thanks for stopping by Ellen. I'm in Baltimore, so we are still dealing with the fallout of the riots and the actions that lead to them - years of things, not just the precipitating action. I have such respect for those in the job, that I still find it hard to wrap my head about the existence of "bad" cops. Of course, they exist, as they do in every profession. But then I try to think about what life would be like if we didn't have cops? We saw less of a willingness for bystanders to step in after cases where those that tried to help have been sued or criticized for their actions. And I feel that the police may be second guessing when to step in - I have no evidence that this is true, but just a sense that who wouldn't say "why bother" - but it is their JOB and most of them feel a calling to step forward. I, for one, would not want to be in their shoes. How very interesting. The book I'm subbing now ends with a shooting (which is justified), but there is the question of how to deal with it in the next book. And I'm working on another project with a homicide detective protagonist dealing with PTSD. So I will have to look up your work. Taking a citizen's police academy and attending Writer's Police Academy was such an eye-opening look into police work - event though I knew conceptually it was a hard job. Nothing like doing a "shoot/don't shoot" simulation to really make you understand the stress. Hi Everyone: We're just waking up here on the West Coast. Glad to find so many comments. Citizens' Academies are excellent ways to get behind the badge and further your understanding of what cops do and why they do it. I've never been to the Writers Police Academy but I hear it's great. I recently attended the International Association of Chiefs of Police annual conference in Chicago. We had many prominent speakers, including President Obama. I am encouraged to think our national conversation on reforming the criminal justice system has traction. There were lots of discussions about improving police/community relations, modifying training to include an emphasis on de-escalation tactics, better record keeping and - these are my words - changing the law enforcement mindset from warrior to guardian. Ellen, I love that phrase. "Changing the law enforcement mindset from warrior to guardian." I know in Maine we have far fewer complaints against police, police shootings, and episodes of citizen-police conflict. We're mostly smaller communities, so many LEOs know the people they're policing and feel a part of the community themselves. We're low-crime, so much of the work cops do IS serving the community as a guardian. Finally, we've been lucky to have a real push by many police chiefs to educate their officers and work with local organizations on issues better solved by understanding than by force. There's been a great deal of mental illness education in our area, for instance, and the chief of the Portland PD set up a special group to work with the elders of our Somali community to help keep their young men out of trouble. Warrior to guardian... seems like the right direction. Happy to see you on Jungle Red, Ellen. So many of us write about police without really understanding what it's like to do that job and all it entails. Yes, I love that Ellen really can get into the thought process, and the calculations, and the training, and the goals. I'm writing, right now, a scene where a police officer has to make a fast decision, and I'm staring at the computer screen, thinking it through, weighing the options. Then I realized in real life a police officer doesn't have that time. Sounds like an interesting conference, Ellen. I wish I could say our police chief was interested in shifting the department towards community-led policing. Instead (among many other things not conducive to serving the public) just this summer he cut the budget for our small mounted division. The mounted division not only patrols neighborhoods in the historic part of town, but they are very important for crowd control at all our big festivals and events. They also allow the public, and especially children, to interact with the police in a positive way. The good news: There was a huge outcry and community protest. We will keep our mounted officers a little longer, with some help and additional funding from the community. I salute you, Ellen, for your efforts to work with those suffering from PTSD and other fall-out issues from doing the work of a police officer. The fact that you can put a distance between your work and the fiction you write is impressive. Recently--and can't remember where--read something about how the number of complaints against police officers decreases significantly the more female officers there are on a force. I think it's more of that 'warrior to guardian' idea--women are often the peacemakers--between siblings, between spouse and children, between their kids-- could you speak to this idea in light of your work, Ellen? Oh, I did see that article -- confession: I swiped the magazine from a doctor's office, but I returned it the next week! Ellen's book on police families -- I Love a Cop -- was a big help to me in figuring out the relationship between my protagonist and her ex-husband, a bike patrol officer in Seattle. And I appreciated that Ellen gave us real (disguised) cases to look at, including women officers, who deal with the stresses of the job differently. A great resource for authors, and for anyone who wants to understand "the job" and those who do it. Congrats on the new book, Ellen! John was a street cop for fifteen and a half years; when he was promoted to sergeant, he worked in the jail for six months, then became a nine-one-one supervisor. He says, sure, he'd be happy to answer any of the Jungle Red's questions . . .
John's not big on police shows, per se; he watches NCIS, Castle, and Bones and says they pretty much get it right, with a bit of writer's license. Hill Street Blues, he says, was much better at portraying what it was really like to be on the job. John says Adam-12 was a great recruiting tool for LAPD. For years the show was used by other departments as training films because the tactics Malloy and Reed used were right. When another officer on the show used an incorrect tactic, the story always brought that out. He says Dragnet was much more sanitized because it was broadcast so many years earlier. Today, he says, everything is different. John's not big on books about the job; he's much happier with historical non-fiction. good science fiction, and Clive Cussler-type stories. HillStreet Blues! I hear this everywhere--what do you think, Ellen? And oh, Joan, thanks to your dear husband! I know we'll have questions. like--If someone pulls a weapon, would a police office know right away what kind of gun it was? Ellen, what do you think? Hi All: THE RIGHT WRONG THING speaks directly to the issue of women in law enforcement. After Randy kills the teenager she is suddenly a hero to the men who had previously made her life miserable. She finds this repugnant. Her chief, also a female, has a long history with discrimination against women. Something that doesn't stop as she rises through the ranks. I don't have current exact statistics but women are rarely involved in use-of-force complaints. I am a big proponent of having more women officers. Sadly, in my thirty years as a police psychologist, the percentage of women in law enforcement has remained steady at about 10-12%. I loved Hill Street Blues and wrote a piece for the Ben Bella anthology WHAT WOULD SIPOWICZ DO? My entry was titled "Bare Butts and Bare Souls.Southland got it right some of the time, so did the old Police Story and the comedy Barney Miller. I'm dating myself, I know. Well, if you're dating yourself, I'm there with ya! Ellen, I really loved your book! Thanks Hank and all the other Reds for hosting me. And thanks to everyone who posted a comment. If I can be of help to anyone with questions about police psychology and/or the psychology of policing, contact me through my website. I'd love to hear from you.